When you understand your newborn’s sleep patterns and habits, you can start to establish a little more structure in your daily life and build a little more confidence in your decisions and actions during the baby’s first days. 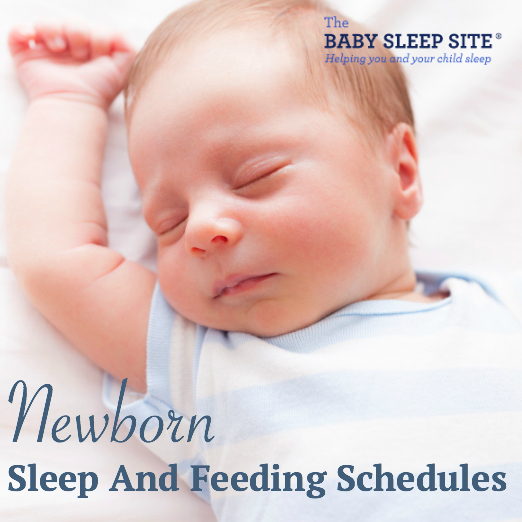 While newborns can’t stay on a strict sleep or feeding schedule – mostly due to their many growth spurts in these early months – these sample newborn sleep and feeding schedules can guide you through these stages and make sure everyone is getting the sleep and nutrition they need. Otherwise, you may be soothing a crying baby all day. A newborn baby cries a lot more when they are over-tired, not sleeping enough, or hungry. In other words, getting him or her on a routine (even if it’s not a strict schedule) can be a life-saver! Your newborn’s feeding schedule should be age-appropriate, and you should never withhold food from a newborn just to stay on schedule. A newborn sleep schedule is also often based on how long your baby can stay awake (not strictly by the clock), which is usually short in the newborn days. Keep reading to discover what you can do to get started. A baby is considered a newborn from birth until about 3 months of age. During this period, your newborn’s sleep patterns will look nothing like yours. Your baby will sleep in short bursts – anywhere from 30 or 45 minutes to 3 or possibly 4 hours – and then eat between periods of sleep. In other words, the typical day/night sleep cycle doesn’t really apply to newborns. Some newborns come out of the womb with their days and nights completely mixed up! This is called day/night confusion, and babies who struggle with it tend to sleep a lot during the day and then wake up frequently at night. Many newborns also seem extra sleepy in the first week or two after birth and must be woken up to feed or drift off while feeding before getting their fill. Eventually, though, your newborn will definitely “wake up” within three weeks after birth. This is when you will start to deal with more wakefulness. In fact, you may start to miss the early weeks of having a super-sleepy newborn! Babies simply cry more often as they get a bit older (depending on temperament), but you will quickly learn how to soothe a crying baby. Newborns feed very, very frequently, but this isn’t a problem that needs to be solved. Your newborn’s tummy is quite small. They simply need to fill it up regularly. Formula-fed newborns may need to eat slightly less often than breastfed newborns because it takes a newborn’s tummy longer to digest and break down formula. So babies tend to feel fuller for longer periods of time. Breast milk, on the other hand, is digested fairly quickly. How much breastmilk or formula does your baby need? Every situation is different, of course, but if your baby is formula-fed, you can use a fairly simple formula to determine approximately how many ounces your baby needs in a day. Simply multiply your baby’s weight by 2.5. For example, an 8-pound baby would need about 20 ounces of formula in a 24-hour period. If your baby is breastfed, the general rule is that most newborns need between 20 and 30 ounces of breastmilk (and between 25-35 ounces once they’re past the newborn stage). In general, if you are exclusively nursing, it’s best to nurse on demand in the first few weeks after birth to ensure that your milk supply becomes well-established. In fact, in order to maintain your supply, you’ll need to nurse every 2 to 3 hours, on average. Once your baby is past 3 months of age and is in the infant stage, that will slowly stretch into 5-6 hours, and then 7-8, and eventually right up to 10 or 11 hours once your baby is 9 months old or 10 months old. Believe it or not, a lot is going on with your newborn baby. During these growth spurts, it will feel like your newborn is feeding almost constantly (and like when she’s not feeding, she’s sleeping). This is 100% normal – feed your newborn as often as she needs it, as the extra nourishment is important during the growth spurt. Your unique newborn’s wake times and total sleep needs may vary from what is recommended below. These schedules are based on averages, but your baby may need more or less sleep (or shorter/longer wake times) than what is listed here. Remember, watch your baby’s sleepy cues closely (rubbing eyes, yawning, staring off into space, etc. ), and let those guide the sleep schedule. Remember, too, that if your baby is already fussing, he or she is already overtired. Try to get your child down for his or her nap earlier next time, before the fussing starts. This schedule is best for babies who consume average amounts of breast milk and for moms who have average breast milk production and storage amounts. Babies who eat smaller amounts, babies with reflux, and moms who produce and store smaller amounts of breastmilk will need a different schedule. So will babies who eat larger amounts per feeding and moms who produce/store greater amounts of breast milk. Schedules for those scenarios, as well as schedules for older, breastfed newborns, are available in our newborn book, Essential Keys To Your Newborn’s Sleep. This schedule recommends longer naps and fewer feedings than the breastfeeding schedule above, simply because formula is more difficult for baby to digest. So, babies tend to feel fuller longer and therefore need slightly fewer feedings. For formula-feeding schedules for older newborns, see our newborn book, Essential Keys To Your Newborn’s Sleep. My 9 week old baby has really struggled to get into any sort of schedule. He has colic and reflux as well as tongue ties that had to be cut. He was sleeping ok at night, going down at 7pm, feeding around 11pm, 2:30 and 5:30am. He would then be up for the day at 7am. Over the past two weeks though he’s awake up to 7 times a night and he’s extremely hard to get back to sleep. I’m trying to follow your schedules above, I’m hoping this will help, but any other advice you have would be very much appreciated. Are there any samples schedules for 10-13 week olds. Our baby was doing reasonably well in the 8-9 week mark (sleeping up to 5 hours consecutively) but then got her vaccines at 10 weeks and around that time started waking several times a night. I have read this experience is common – and we are following the tips provided here (thanks). Please let us know if we can help further, and good luck! This sounds like a good schedule, but with the feed and go right back to sleep part btw 11:30pm and 6:30am, where is there a time for changing a wet/ poopied diaper? Hi @Carolina – Thanks for writing and for using us as a resource for sleep! Feel free to make the suggested schedule your own, and defintely take a few minutes to change a diaper when needed! You can squeeze that right into the schedule at anytime! My 4 week old is not really having long wake times before 4pm. She’s falling asleep right after having her bottle which is sometimes resulting in 30 min naps & is feeding every 2 hours. After 4-5pm, she’s very awake for 2-3 hours & is very difficult to get down for naps. I try to start her bedtime routine around 9:30 especially if she’s been up since 7:30. Most times she goes right to sleep, but sometimes it takes 1-2 hours to put her to sleep. If she doesn’t take a catnap before 8pm & falls asleep sometime after 8-8:30, it takes so long to get her down for bedtime. Granted she does sleep 4-6 hour stretches at night, but the late afternoons are exhausting. Does this sound pretty normal? I hope this helps and you enjoy lots of precious newborn cuddles! Such a wonderful time.